[S148] FindAGrave.com, memorial #135945742, citing Eliot birth recs for siblings. Findagrave.com, memorial #84733377. Photo by A Helper. [S1860] 1860 U.S. Census, Eliot, York, ME, M653/450/22, Jeremiah Brooks. [S1850] 1850 U.S. Census, Eliot, York, ME, M432/274/236, Jeremiah Brooks. 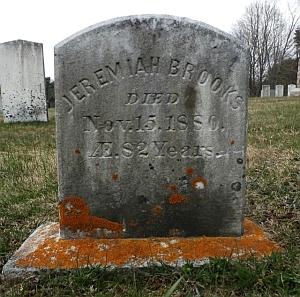 [S1870] 1870 U.S. Census, Eliot, York, ME, M593/564/254B, Jeremiah Brooks. [S1880] 1880 U.S. Census, Eliot, York, ME, page unrecorded, Alpheus H. Brooks. [S148] FindAGrave.com, memorials #84733572, #84733528. [S1694] Daniel L. Brooks, death certificate, digital copy courtesy Allison Anderson. [S1850] 1850 U.S. Census, Eliot, York, ME, M432/274/236, Betcy Brooks. [S1477] Dana Rae Pelletier, "Mount Pleasant and Greenwood Cemeteries, Bolt Hill Road, Eliot, ME," Betsey Brooks family. Descendants of William/5k Brooks Jr.
Findagrave.com, memorial #135626927. Photo by R. Moore. [S1379] Maine Old Cemetery Association, Cemetery Inscriptions of York County, Maine, 1:598, Capt. 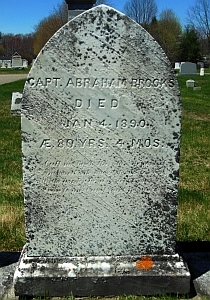 Abraham Brooks. Hereinafter York Co. Cemetery Inscriptions. [S1427] York County Marriage Returns 1831-1888, 91, Abraham Brooks/Mary J. Brooks m.
[S59] Portsmouth (NH) Journal of Literature and Politics, 16 Feb 1839, Marriages, Mr. Abraham Brooks/Miss Mary G. Brooks. [S148] FindAGrave.com, memorials #135626927, #135627053. [S1379] York Co. Cemetery Inscriptions, 1:599, Elbridge Brooks. [S1690] The Goodwin News, 4:3 (Apr 1982): Alice B. Goodwin Sharp, "My Great Grandmother Was a Card." [S76] NH Vital Records, state copy, 1866, Abraham Brooks/Lovinia E. Wheeler m.
[S1870] 1870 U.S. Census, Eliot, York, ME, M593/564/254B, Abraham Brooks. [S1379] York Co. Cemetery Inscriptions, 1:599, Eliza J. Brooks. [S148] FindAGrave.com, memorials #135626927, #135626975, #135627053.